Years ago, in my quest to see as many National Parks as possible before I die, I visited the Grand Tetons. While there, my traveling companions and I hiked the steep Cascade Canyon trail, hoping to see a moose. We finally spotted one way down at the bottom of a ravine, lying in tall grass near a stream. Without strong binoculars and a cluster of other hikers pointing and snapping pictures, we never would have noticed him. Later that day, we pulled our van into a mini-mart to buy drinks and snacks. Guess what was wandering around in the parking lot? Yep. A moose. 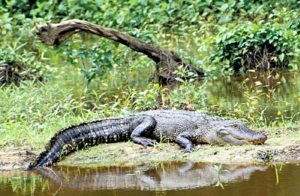 All of which is to say that if you go to Florida looking for gators, you needn’t travel deep into the wilderness to find them. On a getaway last month, my friends and I motored around Corkscrew Swamp Sanctuary in an airboat. We spent the better part of another day on Sanibel Island at the Ding Darling National Wildlife Refuge, which was great fun. But on those two adventures, we saw a grand total of only four alligators. Which pretty much broke my heart. Because I’d come to Florida to see gators. Lots and lots of gators. I pulled out a vacation guide, trying to decide if we were close enough to the entrance of Everglades National Park to make it there and back in an afternoon. No. Then I learned about Gatorland near Orlando. Perfect. Except it was also too far to travel in the amount of time we had left. The three of us wandered half-heartedly toward an immaculately manicured golf course, as different from the wildness of a swamp as it’s possible to be. “You ever see gators around here?” I asked a man who was retrieving a newspaper from the end of his driveway. My heart was hammering as he pointed to a nearby pond and told me that’s where he thought the gator lived. Sure enough, lying on a muddy bank about a hundred yards from where we stood, was something long and dark. But it wasn’t moving. And because we didn’t have binoculars, we couldn’t be sure what it was. Probably just a big log. Or a piece of metal pipe. An alligator couldn’t possibly grow that long. Could it? I found a golf ball at the water’s edge and threw it at the mysterious object. I missed by a mile. The object didn’t move. We named him Big Al and went to visit him every day until time came to head back to Tennessee. Al was always in the same spot, waiting for us with a big grin on his face. Proof positive that not all wild things live in the wild.